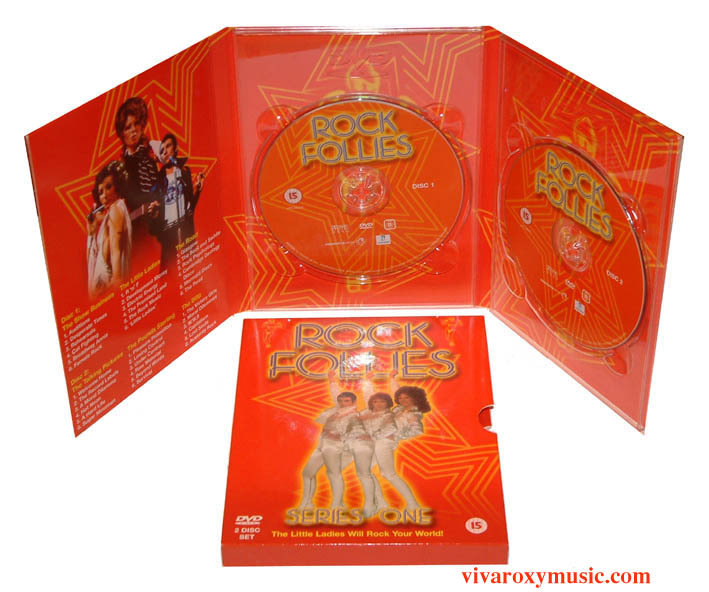 This DVD has all 6 episodes from the first series of Rock Follies originally broadcast in 1976. Andy Mackay wrote the music for the series with Howard Schuman writing the lyrics as well as the screenplay. Andy Mackay appears in a cameo role on 'The Blitz' as part of the band. There is also an interview with Andy Mackay as a special feature on one of the discs. Since it's original transmission in 1976, Rock Follies disapearred from our screens. Now the BAFTA award winning series is back with digitally enhanced sound and vision - so the 'Little Ladies' look and sound better than ever! Rock Follies follows the fortunes of 'The Little Ladies' - 'Q' (Rula Lenska), 'Dee' (Julie Covington), and 'Anna' (Charlotte Cornwall) through the ruthless world of the music business with all its ups and downs. The three girls have been promised stardom in a West End musical called Broadway Annie - but when the show closes early, the girls are persuaded by Derek 'Hyper' Huggins to form a band and make a bid for rock stardom. Will they reach the big time? Prospects are bright and the future is full of expectations - it's just the beginning for 'The Little Ladies'.